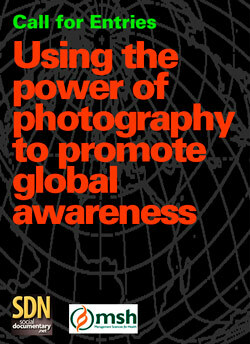 Since SocialDocumentary.net launched in 2008, our tagline has been “Using the power of photography to promote global awareness.” We are now making this the theme of our next call for entries. Two Grand Prize winners will be each awarded a $4,000 fellowship to spend up to two weeks documenting the global health projects of Management Sciences for Health (MSH),www.msh.org. An additional monetary award and two honorable mentions will be specifically honored by SDN. SDN is especially excited to announce that all winner’s work will be featured in an exhibition at powerHouse Arena, Brooklyn, NY,February 27 to March 23, 2014. Submissions will be reviewed by a panel of industry professionals. All winning entries will participate in an exhibition at powerHouse Arena, Brooklyn, NY,February 27 thru March 23, 2014. There will also be a web-based component to the exhibition. SDN and MSH will pay all printing and preparation costs for the exhibition. >>Click here for more information and application instructions. Next Next post: Change the world, one photo at a time.